Hilo (/ˈhiːloʊ/; Hawaiian pronunciation: [ˈhilo]) is the largest town and census-designated place (CDP) in Hawaii County, Hawaii, United States, which encompasses the Island of Hawaiʻi. The population was 43,263 at the 2010 census. Around 1100 AD, the first Hilo inhabitants arrived, bringing with them Polynesian knowledge and traditions. Although archaeological evidence is scant, oral history has many references to people living in Hilo, along the Wailuku and Wailoa rivers during the time of ancient Hawaii. Oral history also gives the meaning of Hilo as "to twist". 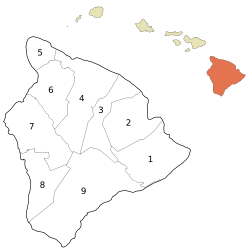 Originally, the name "Hilo" applied to a district encompassing much of the east coast of the island of Hawaiʻi, now divided into the District of South Hilo and the District of North Hilo. When William Ellis visited in 1823, the main settlement in the Hilo district was Waiākea on the south shore of Hilo Bay. Missionaries came to the district in the early-to-middle 19th century, founding Haili Church, in the area of modern Hilo. Hilo expanded as sugar plantations in the surrounding area created new jobs and drew in many workers from Asia, making the town a trading center. A breakwater across Hilo Bay was begun in the first decade of the 20th century and completed in 1929. On April 1, 1946, a 7.8-magnitude earthquake near the Aleutian Islands created a 46-foot-high (14 m) tsunami that hit Hilo 4.9 hours later, killing 160 people. In response, an early warning system, the Pacific Tsunami Warning Center, was established in 1949 to track these killer waves and provide warning. This tsunami also caused the end of the Hawaii Consolidated Railway, and instead the Hawaii Belt Road was built north of Hilo using some of the old railbed. On May 2, 1960, another tsunami, caused by a 9.5-magnitude earthquake off the coast of Chile the previous day, claimed 61 lives, allegedly due to the failure of people to heed warning sirens. Low-lying bayfront areas of the city on Waiākea peninsula and along Hilo Bay, previously populated, were rededicated as parks and memorials. Closure of the sugar plantations (including those in Hāmākua) during the 1990s led to a downturn in the local economy, coinciding with a general statewide slump. Hilo in recent years has seen commercial and population growth, as the neighboring District of Puna became the fastest-growing region in the state. Hilo is on the eastern side of the island of Hawaii at 19°42′20″N 155°5′9″W﻿ / ﻿19.70556°N 155.08583°W﻿ / 19.70556; -155.08583 (19.705520, −155.085918). It is classified by the U.S. Census Bureau as a census-designated place (CDP), and has a total area of 58.3 square miles (151.0 km2), 53.4 square miles (138.3 km2) of which is land and 4.9 square miles (12.7 km2) of which (8.4%) is water. Hilo has a tropical rainforest climate (Köppen Af), with substantial rainfall throughout the course of the year. Its location on the eastern side of the island, (windward relative to the trade winds), makes it the fourth wettest designated city in the United States, behind the southeast Alaskan cities of Whittier, Ketchikan and Yakutat, and one of the wettest in the world. An average of around 126.72 inches (3,220 mm) of rain fell at Hilo International Airport annually between 1981 and 2010, with 272 days of the year receiving some rain. Rainfall in Hilo varies with altitude, with more at higher elevations. At some weather stations in upper Hilo the annual rainfall is above 200 inches (5,100 mm).. As the trade winds are almost permanent and cyclones are not rare in Hilo, the climate is not equatorial but maritime trade-wind tropical climate. Monthly mean temperatures range from 71.2 °F (21.8 °C) in February to 76.4 °F (24.7 °C) in August. The highest recorded temperature was 94 °F (34 °C) on May 20, 1996, and the lowest 53 °F (12 °C) on February 21, 1962. The wettest year was 1994 with 182.81 inches (4,643.4 mm), and the driest was 1983, with 68.09 inches (1,729.5 mm). The most rainfall in one month was 50.82 inches (1,290.8 mm) in December 1954. The most rainfall in 24 hours was 27.24 inches (691.9 mm) on November 2, 2000. Hilo's location on the shore of the funnel-shaped Hilo Bay also makes it vulnerable to tsunamis. As of the census of 2010, there were 43,263 people in 15,483 households residing in the census-designated place. The population density was 796.7 people per square mile (307.7/km²). There were 16,905 housing units at an average density of 311.3 per square mile (120.2/km²). The racial makeup of the CDP was 17.61% White, 0.52% African American, 0.31% American Indian & Alaska Native, 34.29% Asian, 14.17% Native Hawaiian & Pacific Islander, 0.60% from other races, and 32.51% from two or more races. Hispanic or Latino of any race were 10.40% of the population. There were 15,483 households out of which 24.3% had children under the age of 18 living with them. The average household size was 2.79. In the Hilo CDP the population was spread out with 21.3% under the age of 18, 11.3% from 18 to 24, 11.5% from 25 to 34, 16.9% from 35 to 49, 20.9% from 50 to 64, and 18.0% who were 65 years of age or older. For every 100 females, there were 95.5 males. For every 100 males there were 104.7 females. Hilo is served by the county Hele-On Bus. Hilo is served by the Big Island's largest harbor, Hilo Harbor, on Hilo Bay. 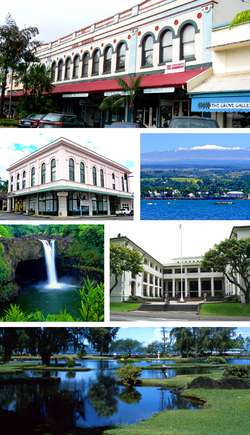 Hilo is the oldest city in the Hawaiian archipelago. Tourism is important. It is home to Hawaii's only tsunami museum, mostly dedicated to the understanding of the 1946 Pacific tsunami, and is notable for the banyan trees planted by Babe Ruth, Amelia Earhart, and many other celebrities. It is also home to the Pana'ewa Rainforest Zoo, several shopping centers, cafés and other eateries, movie theaters, hotels, restaurants, and a developed downtown area with a Farmers Market. The Mauna Loa Macadamia Nut Corporation makes its home there as well, south of the main town off Hawaii Route 11, north of Keaʻau. Hilo is also known for the Mokupāpapa Discovery Center in the Koehnen Building downtown. The museum features interactive and educational exhibits and is dedicated to creating public awareness of the Papahānaumokuākea Marine National Monument and ocean conservation issues. Hilo is home to a number of astronomical observatories on Mauna Kea as well as the Imiloa Planetarium and Museum. Astronomy has an economic impact of $100 million annually on the Big Island of Hawaii. Astronomy on Mauna Kea was developed at the invitation of the Hawaii Chamber of Commerce following the collapse of the sugar cane industry. Hoʻolulu Park, a large park complex at 19°43′9″N 155°4′3″W﻿ / ﻿19.71917°N 155.06750°W﻿ / 19.71917; -155.06750﻿ (Ho'olulu Park), includes the Afook-Chinen Civic Auditorium, Walter Victor Baseball Complex, Dr. Francis F.C. Wong Stadium, Sally Kaleohano's Luʻau Hale, Edith Kanakaole Multi-Purpose Stadium and Sparky Kawamoto Swim Stadium. Hilo is served by KWXX (94.7FM Hilo/101.5FM Kona), Hawaii's "Feel Good Island Music Station", KWXX, B93/B97 (93.1FM Kona/97.1FM Hilo), Hawaii's Classic Hits, B93/B97, and KPUA (970AM Hilo), Hilo's Sports Talk Radio KPUA 670AM radio stations. The Hawaii Tribune-Herald, of Oahu Publications Inc., a subsidiary of Black Press, is Hilo's primary newspaper distribution company along with other newspapers like the Honolulu Star-Advertiser. Asteroid (342431) Hilo is named after Hilo. (3) North Hilo and (2) South Hilo Districts are located in the east coast of Hawaii County (the Big Island). They are bordered by Hamakua District (4) in the north, and by Kau District (9) in the south and Puna District (1) in the southeast. The far inland areas are largely unpopulated, being forest reserves on the slopes of Mauna Kea and Mauna Loa. Hilo also referred to the District of Hilo when the Big Island was divided into six districts by the traditional land division of moku. 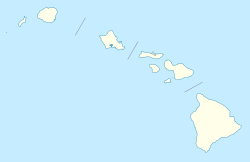 Hilo is now divided into two: North and South Hilo Districts. ^ "Hilo CDP, Hawaii Archived 2011-11-24 at the Wayback Machine." U.S. Census Bureau. Retrieved on May 21, 2009. ^ Johnston, Jeanne Branch (2003). Personal Accounts from Survivors of the Hilo Tsunamis of 1946 and 1960: Toward a Disaster Communications Model (M.A.). University of Hawaii at Manoa. hdl:10125/7104. ^ "Climatologie" by Pierre Estienne and Alain Godard, Éditions Armand Colin (ISBN 2-200-31042-0) , "CHAPITRE XVI 1. Les climats équatoriaux et subéquatoriaux 2. Les climats tropicaux 3. Les climats d'alizé 4. Les climats de montagne LES CLIMATS DE LA ZONE INTERTROPICALE : LES VARIÉTÉS", pages 314, 315 and 322.